CipherLab Presents a Competitive and High Performance Choice for Smart Businesses - CipherLab Co., Ltd.
Taipei, Taiwan - August 14, 2014- CipherLab, a leading innovator in Automated Identification and Data Capture (AIDC) has released the CP55 series mobile computer today. This model is constructed to provide just the right amount of protection for the businesses looking for high performances. It comes with unique features and top of the line processor to complete tasks easily and efficiently. It is also equipped with loads of value-added software for simple customization and operation. 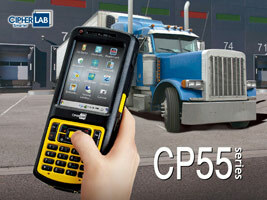 The CP55 series mobile computer is designed to meet conditions with powerful applications and practical protection. Packed with a dual core TIOMAP™ 4 Processor, users are able to run multiple applications faster to speed up operation. It also comes equipped with Windows Embedded Compact 7.0, Microsoft's most up-to-date mobile operating system. In terms of scanning capabilities, the CP55 satisfies a wide range of options with linear imager, laser, long range laser, 2D imager and HF RFID reader. "We are really excited to include the CP55 series into our diverse product portfolio," Steven Liau, chairman of CipherLab noted,"The CP55 series has all the powerful applications with the appropriate protections to provide complete satisfaction for the demanding needs." The CP55 is also designed with flexible wireless communication options that includes 3.75G HSUPA with GPS/AGPS allowing location base application, 802.11 a/b/g/n providing reliable data transfer and Bluetooth V2.1 + EDR connecting mobile devices instantly. Its high capacity of data and program memory gives CP55 a real advantage in storing data and running programs. It is truly a perfect blend between performance and practicality for your business to enjoy. For more details and specifications regarding CipherLab CP55 or other CipherLab products, please visit www.cipherlab.com.